Recipe and image from Jazzy Vegetarian Classics: Vegan Twists on American Family Favorites by Laura Theodore. Reprinted with permissions by the publisher, BenBella Books. Fit a steamer basket into a medium sauce pan with a tight-fitting lid. Add 2 inches of cold water, then add asparagus. Cover and bring to a boil. Steam the asparagus for 4 to 6 minutes or until crisp-tender. Meantime, put the lemon juice, tofu, turmeric, and salt in a blender and process until smooth. Transfer to a small sauce pan and cook over low heat, stirring constantly, until heated through. 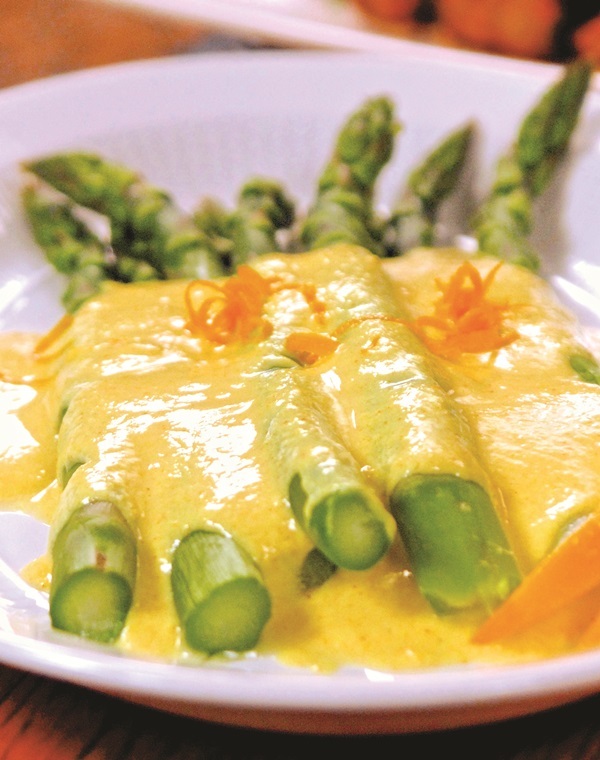 To serve, arrange the hot asparagus on a serving platter and pour the sauce over top.